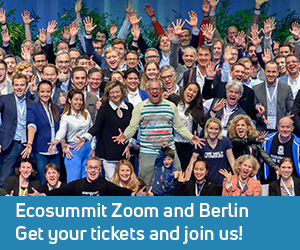 The photo above shows the Ecosummit team and ambassadors on stage at ECO12 Berlin. Below are some more photos of happy ambassadors. Please note that we do not cover any travel expenses. We kindly ask our ambassadors to arrive at the Langen Foundation on Tuesday, 13 November, no later than 13:00, and stay until Thursday, 15 November, 19:00. Tuesday is the set up day of the conference during which we need your helping hands. It also enables us to foster team building and making sure that everybody knows what to do when and how. We will provide you with a manual and shift plan prior to the event. After the event, you will get an Ecosummit Ambassador Certificate from us which you can use for future applications. Please apply by sending us your English CV and motivation email to ambassador@ecosummit.net. The application is open until we have reached 13 ambassadors. We appreciate if you connect with us on Facebook and Twitter and help us spread the word. We are grateful for your support and look forward to hearing from you soon. Ecosummit Ambassador Vasileios Latinos from Greece: During my studies as a civil engineer with a focus on environmental management and then as a master student at TU Berlin, I always was very engaged in the research of green and pro-environmental technologies and policies and how global, pro-environmental ideas, concepts and strategies can be transferred and applied locally. Therefore, since I would like to continue working in this field, every knowledge and experience that I can get, will help me in my future career. 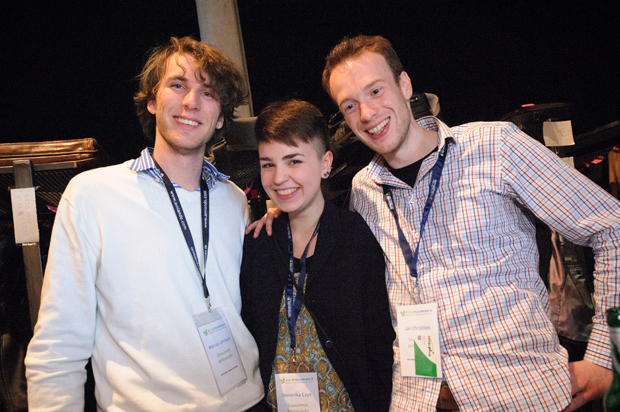 During the summer of 2012, I participated in the Climate-KIC education programme called Journey 2012. Coming out of the Journey, along with a friend of mine there, we are thinking about continuing our project and making a business out of it. Ecosummit Ambassador Christoph Reisky von Dubnitz from Germany: Growing awareness of the fundamental challenges we are facing today, such as climate change, deminishing natural resources or pollution, has significantly increased the support for people willing to find solutions to these problems. In my opinion, there is no other development in our part of the world that is more dynamic, has more passionate people enganged in it or has a bigger impact on our society as a whole. Therefore I could not imagine something I would rather be a part of and spend my personal energy on. Ecosummit Ambassador Kevin Ramírez from UK: I completed a master in Eco-Innovation at the University of Versailles Saint Quentin in France and currently do an internship with a cement company investigating the recycling of carbon dioxide into valuable products such as methane, methanol and other chemicals. During my placement year I started a program for energy management in a citric acid plant in Colombia. A year later I moved to Madrid and worked for GlaxoSmithKline in the marketing department of Neurosciences. In my last job at Pall Corporation in Portsmouth, United Kingdom, I was part of the R&D team in charge of the applications and validation of innovative biotech devices. 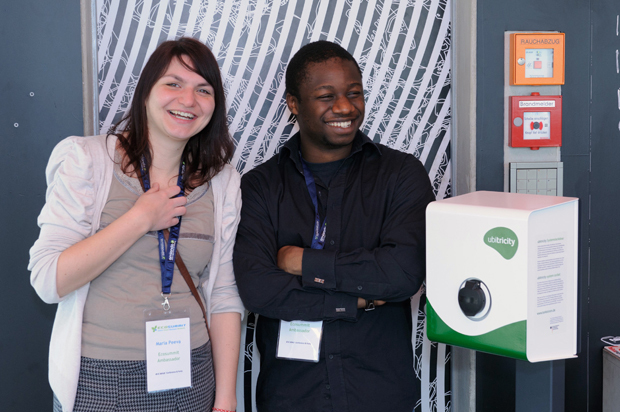 My education, work experience, and enthusiasm for innovation and entrepreneurship make me a perfect candidate to represent the vision and values of Ecosummit Düsseldorf 2012. Ecosummit Ambassador Kailun Hong from China: I am starting my second year of my master program Sustainable Resource Management at TU Munich focusing on international environmental policies and renewable energy technologies. This summer break I am interning at UNEP (United Nations Environmental Program) through which I deepen my conceptual and practical know-how of cooperation and coordination among international environmental policies. It’s also mind-opening to learn about advancing renewable energy development beyond the technical part, through sustainable investment, standard setting, capacity building and policy engagement. In the past, I was working as liaison between the city pavilion and sponsors during the 2010 Shanghai World Expo. Ecosummit Ambassador Enkeleda Kadriu from Albania: At the moment I am working as a Researcher at FH Jena for a EU project (www.foreurope.eu) with focus on socio-ecological transitions. At the same time, I am also a PhD candidate with focus on social and sustainable housing and I have strong interest in energy issues (renewable energy, energy efficiency etc.) and green economy. The Ecosummit is a very good opportunity to participate in both as a supporter and beneficiary from the numerous and valuable panels and presentations. I have some experience in organization matters, management and services, and I am ready to add valuable support during the two conference days. Ecosummit Ambassador Victoria Aragón from Argentina: I have finished my studies in Civil Engineering in the current year. Now I am looking to get involved in the fields of water resources and waste management. I want to make an impact and create awareness about the change that the implementation of the right technology can create in the environment and the lives of the people. I also believe there are major environmental issues not taken into account in my country of origin, Argentina, and I would like to learn to be able to engage more local companies into the field of green engineering, and share the different solutions that are being taken into action in developed countries. Ecosummit Ambassador Viktor Heinrich from Russia: In April 2010, I started to study Power Engineering and Process Technology at Berlin Institute of Technology in which I will graduate upcoming summer. Concerning my interests which are both political and technical I plan my future studies and jobs to be within the area of green and responsible technologies. Due to being born in the Soviet Union, my travels in Australia, my academic stay in Spain and my voluntary work within AIESEC I see myself an open-minded, intercultural and widely interested person. I learned how important it is to take responsibility, not only for me, but especially for others. Ecosummit Ambassador Johannes Millowtisch from Germany: I am actively engaged in pursuing opportunities to learn more about sustainable energy generation, distribution and consumption. As a mechanical engineer, I aspire to pursue a career in sustainable energy technologies, with a particular interest in renewables as well as clean combustion. At university, I delivered a first class dissertation on modelling renewable energy systems to create a scenario for commercially viable zero energy supermarkets. After graduation, I worked at the Tyndall Centre for Climate Change Research, where I developed a model that predicts uptake of domestic renewable energy systems in the UK. Having worked with GIS specialists during this internship, I was invited to present my findings at the ESRI UK Higher Education Seminar in London. Currently, I am on the global graduate development programme at IMI plc, a company that focuses on growth drivers in support of the natural environment and the responsible use of its resources. Having left my native country, Germany, at the age of 16 in order to study at an international boarding school in England, I have had the wonderful opportunity to live alongside people from all over the world. I strongly believe cooperation and innovation are needed to overcome the major challenges of the 21st century, including climate change, resource scarcity and poverty. Ecosummit Ambassador Christian Hodgson from Germany and USA: It is an honor to partcipate in ECO12 Düsseldorf as an ambassador. Having followed the event and the industry for a while, I think you are doing a great and important job in linking high-potential smart green startups with the VC community. With experience both in energy and cleantech, as well as in events anywhere from 50 to 500.000 people, I hope to contribute a little bit to making everybody’s participation a great experience. Having lived in ten countries I am especially looking forward to exchanging ideas on cross cultural partnerships. Let us turn the transition to a green economy up a notch! Ecosummit Ambassador Roman Zinchenko from Ukraine: Ecosummit has become a role model for us since our organization Greencubator also produces events to promote renewable energy, sustainability and green business opportunities in Ukraine. We are a non-profit energy awareness network, uniting some of the best universities, assisting media with learning about sustainable development, and advocating energy efficient policy changes at Ukraine’s State Agency for Energy Efficiency and Energy Saving. I am looking forward to joining the conference as Ecosummit Ambassador to learn from the Ecosummit team and the participating investors and startups. My goal is to strengthen Ukraine’s cleantech community. Ecosummit Ambassador Diana Süsser from Germany: I am a highly motivated graduate student in Integrated Climate System Sciences working on smart green innovations. During my study as climate scientist with a focus on environmental and climate economics, and my work at the Ökopol research institute for environmental strategies, I was very engaged in the research on low carbon and green solutions, and on effective global as well as local climate and energy policies. I was always interested in innovative and sustainable strategies and concepts to transform our economy to a low carbon, green economy. Through my experiences within the EIT Climate-KIC education programme this summer, my motivation grew to continue working on own projects and business ideas related to behavioural and technological change. Ecosummit provides an important chance for me to get in contact with entrepreneurs and climate innovators, and to expand my networks. Ecosummit Ambassador Ognyan Iliev from Bulgaria: I have a strong interest in the Smart Green Economy ever since I participated in the Climate-KIC Summer Journey. I believe the role of ambassador in Ecosummit Düsseldorf will provide me with excellent networking opportunities within the field, as well as the chance to learn more about sustainable development and the green way of living. I am a young entrepreneur with strong organizational skills and attention to detail. Ecosummit Ambassador Alexander Lorenz from Germany: I want to take part in the revolution of energy supply, the possibility for everybody to create their own energy, everywhere and every time. 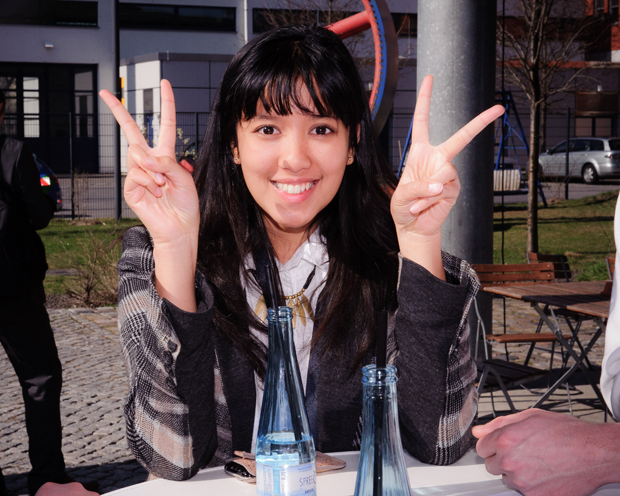 Therefore, I study Power and Process engineering at TU Berlin and want to do my master in renewable energy. At AIESEC, I was responsible to organize and host the so called Newbie Induction Conference in which three Local Committees with a total of 130 people took part. I organised logistics, hotel accommodation, food, technique, speaker flow, team management, party, budget and purchases. At Ecosummit, I want to join the creative atmosphere, get to know people who realized their ideas of a better world and energy supply and who are just one step away from realizing their ideas. I want to get inspired to make my next steps of creating my own company and I want to learn how to become a smart green entrepreneur.